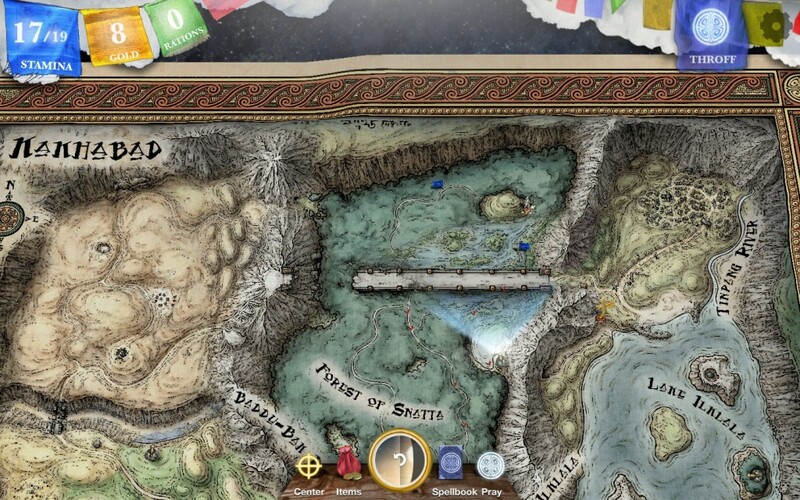 Today, Inkle Studios has just released <em>Sorcery! 3</em> for PC and Mac, and just less than two months ago they released <em>Sorcery!</em> 1 and 2. This is, no doubt, a new great opportunity for experiencing the classic series by Steve Jackson in the best possible adaptation: in the big screen of our computers. So, I’ve interviewed Jon Ingold at Indie-o-rama for the occasion. Absolutely nothing new, at least regarding content, comparing to the apps. The details and extra material you have come to love are of course there. But the adaptation to desktop systems has been done with special care: illustrations and maps in high definition look like never before. The interface, icons, everything fits well. And better yet, Inkle has recorded new songs with orchestra to improve the musical ambiance of the three parts. So those who have already played the apps via cell phone, they will enjoy new music and preciousness of high definition. The main change is the interface. In addition to playing with the mouse, Inkle have created a system of keyboard shortcuts that works pretty well. Seriously, the most comfortable way to play these versions is to use the keyboard. With the arrow keys and the enter you can select the actions to perform, tab key alternate between different points on the mapl, and of course, spells are entered directly from the keyboard, letter by letter. Ideal. In the interview, I catch up with how the Inkle boys are doing. Two words: very well. We talked about the technological wonders that have made possible to see Inkle games on other platforms and how it’s going with the other projects of the study. Sorcery! 4 is coming your way, and they are working on a completely new and original game, and a little bit about the Inkle’s philosophy for Interactive Fiction. Buy the game at Inkle Studios website. “The Legendary Journey Series” is a series of (so far) two gamebooks written by Randy R. Cook, with some unusual characteristics. They try to replicate the experience of the old text adventures of the 80s. Those who had an 8-bit computer back at the time will know which ones I am talking about: text adventures, where we had to explore locations, take every object that wasn’t nailed down and use it in the right place in order to win the game. There is something very tempting about 80s nostalgia. It’s good that new, more complex and grown-up stories are being written, but sometimes we want to get in touch again with the teenager inside us, the one that didn’t care much about such things are “storytelling” or “character development”, and just wanted to have fun saving (again) the kingdom from an ultimate evil, or stopping (again) the alien invasion on Earth. They were simpler, gentler times, and there is a good reason why we keep returning to those stories over and over. They are comforting. They make us remember who we were. And that is exactly the kind of nostalgia that these two gamebooks aim for. 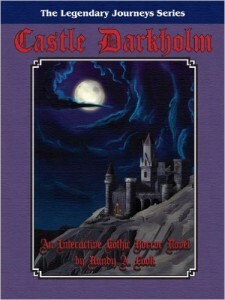 In “Castle Darkholm” you take the role of the Champion, a hero sent by the high council to stop a vampire from taking over the world. As in the other book in this series, you have to solve puzzles in order to find the resting place of the vampire and defeat him for good. The gamebook has a warning: “Content Advisory: This is a gothic horror story and contains examples of blood, gore and intense violence and may not be suitable for some readers.” Which makes it seem to have a more adult content than it has. Think of the same kind of horror as the old Roger Corman or Hammer movies: classic horror with some descriptions of gore. Nothing too original, but good old fun nonetheless. 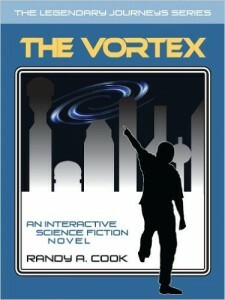 “The Vortex” has a much more interesting story. We are thrown into some strange alien ruins, with very little background story, and the more we explore, the better idea we will have about who we are and what are our objectives. We will finally discover that we have inadvertently unleashed some powerful alien technology that will destroy the universe as we know it, and of course, our mission will be to stop it. This one reminded me a bit of the 90s graphic adventure “The Dig“, and even earlier than that, to the old “Strange Odyssey” text adventure from 1981, with all its weird and dangerous alien technology. As the previous title, nothing too original, but fun to read and play. These two books are not going to change the world, but for those who miss the text adventures of yore, they are the right kind of nostalgia. And they have some very uncommon (for gamebooks) puzzle and inventory mechanics. So, for 5 dollars each of them, why not to give them a try? You can find Castle Darkholm HERE and The Vortex HERE. 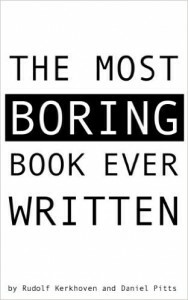 It is simply the most boring book ever written. It tells the story of a former fighter pilot who fought in Afghanistan, Kosovo and both Iraqui wars, but now lives a peaceful life as a commercial pilot for a mid-sized airline. We are going to take the role of this guy at a very uninteresting moment in his life; the moment of waking up and going out to work at the airport. When we see that the first choice we have is to “hit the snooze button” or to “turn off the alarm“, and after that, when we discover that the rest of the choices are things like “using hair conditioner“, “wearing a grey tie or a charcoal one” or “buying a tuna sandwich“, we see what the authors intend with this story: to describe real life at its dullest. If that were the only thing there was to this book I wouldn’t be reviewing it, of course. While we take these completely inconsequential choices, we get a very good picture of this guy: an above middle-class american, living inside a bubble of consumerism, obsessed with appearances and with little to none interest in the affairs of the world around him. A brutal depiction of the self-absorbed US middle-upper class. In spite of its title, it is not a boring book at all. It can be really funny to follow this guy’s trivial dilemmas. We will never empathize with him, but that’s completely sought after. We will just laugh with his obsession with 7-up or the absurdity of his “problems”. There is a really long-winded and absolutely hillarious scene where he spends a good number of pages buying a tuna sandwich. And even more interesting than that: what happens at the end of that scene gives a completely new meaning to the whole story. The authors lied; there is a point to this novella. A subtle but harsh criticism of the United States, their “American dream” and the false sense of security that got so severely compromised after 2001. You can find this gamebook HERE. 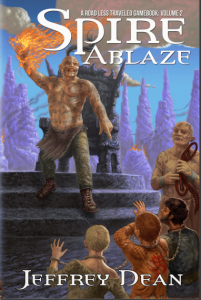 “Spire Ablaze” is the second part of the gamebook series “A road less travelled“, by the canadian author Jeffrey Dean. We will take again the role of the mysterious protagonist of the first part, “Westward Dystopia“, also reviewed in this blog. But here we will go back to a previous period in his life, when he belonged to the “Corps of Engineers” of the city of Root. In this story, the Shapers, a kind of mutants with powers of energy manipulation, attack the Guild of Technomancers and kidnap a group of young students. Our protagonist, along with other recently graduated students, will receive the mission of getting inside the heavily protected Spire, the Shaper city, and rescue the kidnapped students. This book is very different to “Westward Dystopia” in many aspects. In that first book, our protagonist was a lone mercenary, and the general tone was very similar to that of westerns, or movies like “Mad Max“, where a cynical and disenchanted antihero carried out missions for the best bidder, cuestioning at the same time his actions, and those of his contractors. Here we will return to a kinder and less lonely period of his life. A time in which, perhaps innocently, the young Wanderer believed in values like justice or comradership. His colleagues in this mission will be Technician Quill – one of his teachers, now the leader of the team – his best friend Lucille and another two studends called Percy and Willard. Willard, probably the strangest of them all, will spend a great part of the mission taking notes on a small notebook. With this heterogeneous group we will have to get inside the dangerous fortress of the Shapers, the Spire, trying to stay unseen until the very moment in which they recover their kidnapped classmates. On the way there, we will discover many things from the Shapers – the structure of their society, their power struggles or the existence of a mysterious deity called the Oracle, that tries to seize the power inside the Spire. And, even after the mission has finished, the story will keep on revealing some surprises. A meta-story, continued from Westward Dystopia, will give us clues of a conflict taking place in different moments in time, where the individual persons are just pawns on a greater play. When I finished “Spire Ablaze“, I realized that Jeffrey has a very clear idea in mind of how the next books in the series are going to continue, and that this story will keep on branching out and getting more complex as the series goes on. There are other differences with the first part. If “Westward Dystopia” was a gamebook that experimented with different structures and gave a great freedom of choice, here Jeffrey aimed for a “convergent“, more traditional gamebook structure, with a few less choices but much longer sections. Dialogues between main characters are much more important this time, as well as character development. This has its pros and its cons. On the negative side, there is a scene close to the end of the gamebook that, even if it gave a lot of important information about the internal struggles within the Shaper society, it felt a tad too long for not having any interaction – altough Jeffrey has already told me that this will be solved in the Android version of the game. On the more positive side, some of the dialogues are wonderful. 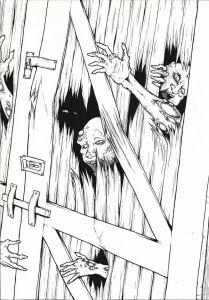 Specifically, Lucille is one of the most credible and “lovable” characters of any gamebook I’ve read recently. “Spire Ablaze” still has the same attention to detail I had the opportunity to enjoy in “Westward Dystopia“. The world described is a complex and coherent one, the Spire is a city with an interesting historical background – we will discover as we read the story that it was a very different place before the Razing – and it still has that detail I loved of dedicating a specific section for each one of the “deaths” we find. Also as in the previous book, “Spire Ablaze” has several different endings – although only one of them called “The Truth” is the real one. If you have played the previous book, you’d know that – even when Jeffrey has done some effort to soften it – it is not a very cheerful one. Is “Spire Ablaze” better than “Westward Dystopia“? I wouldn’t be able to tell. It is a very different story, and it delves deeper in the themes that the first book started. What I can say is that it’s a worthy sequel, and one that fans of Jeffrey Dean’s post-apocalyptic world owe themselves to read. 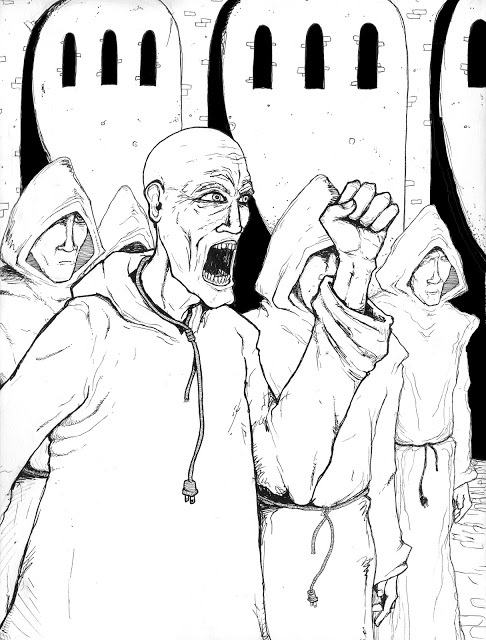 A Kickstarter for a new spanish digital gamebook has recently been created. Or, instead of “gamebook”, this time we could speak of an interactive comic, with a really good looking graphic style reminiscent of Mike Mignola (Hellboy). An 18 year old guy in his last year of high school suddenly wakes up to a zombie apocalypse. Help him find his brother, trapped inside a mall in a very different city than the one whe left before going to sleep! Think horror, comedy and lots of zombies. 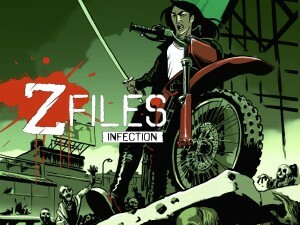 Z Files: Infection is an interactive fiction work based on the gamebook of the same name directed by Fernando Lafuente and Jacobo Feijóo with several other authors. It is set in a world ravaged by the zombie apocalypse. When the project came to us, we had the idea of making a digital gamebook version that would go far beyond the traditional gamebook. This is why with the invaluable help of our artistic director Francis Porcel we have decided to create a video game that explores a unique style that is not commonly seen in digital gamebooks: the interactive comic. You can learn more about this project in the KICKSTARTER page.